Etosha Fishing proudly supports the Promiseland Trust, a non-profit welfare organisation that cares for and assists underprivileged and destitute children in the poor communities of Walvis Bay. One of the Trust’s main activities is a Feeding Project which provides daily home cooked meals in two sittings from Monday to Friday for roughly 250 vulnerable children at the Promiseland Centre in Kuisebmond. The first meal is prepared and served to pre-primary children during their morning activities at the Promiseland Centre and the second for school-going children in the afternoons. In total the Trust provides a meal for approximately 1800 children on a daily basis during the school terms. 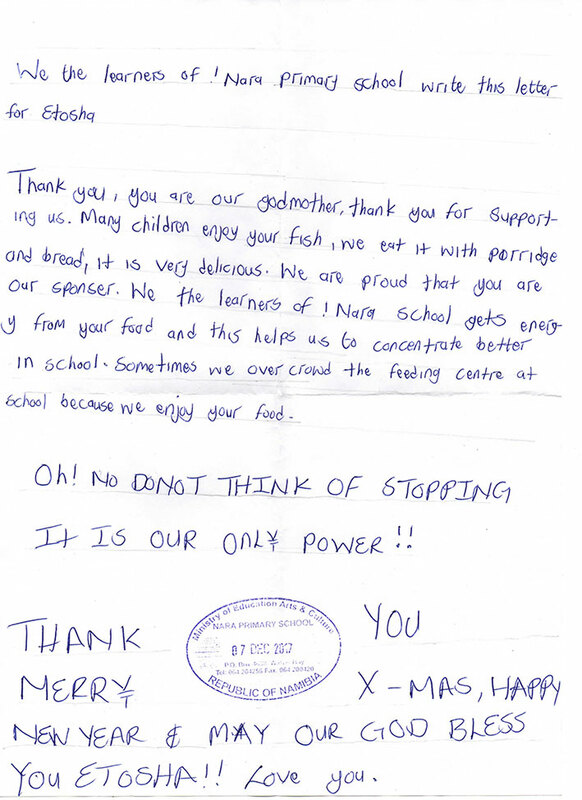 It is heart-warming to receive a thank you letter like this from the children of !Nara Primary School.